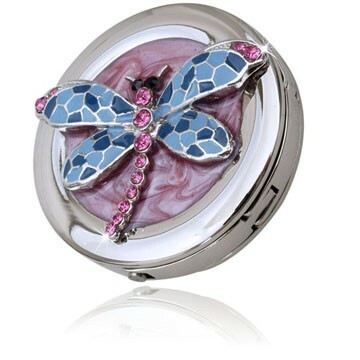 Adorable pink dragonfly decorated with Swarovski rhinestones, it is foldunder Handbag hook and it has a magnetic to keep your handbag hook tidy when it is not being used. Stunning handbag hanger is handy little item to carry in your purse and hook your purse to a table top or other flat surface. The handbag hanger offers a great way to protect your bag. It is also a very ideal gift to your friend or family members.